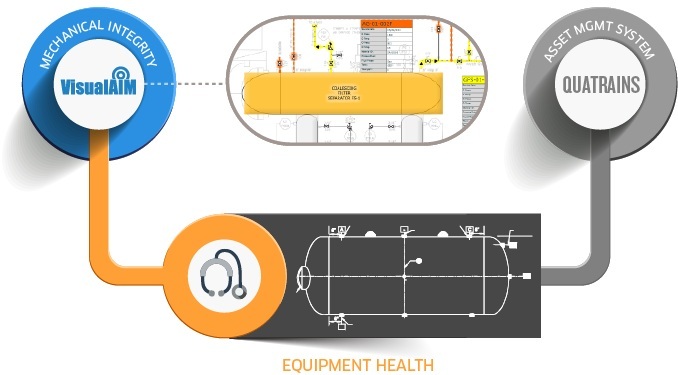 VisualAIM enables the total equipment health equation comprising mechanical integrity AND asset management. Whether utilizing embedded applications from VisualAIM and our technology partners, or third party applications on the owner operator's server or cloud, intelligized drawings visualize, contextualize and analyze both sides of the mechanical integrity and asset management equipment health equation for fixed equipment, rotating equipment, electrical systems and instrumentation and control. The result is improved on time productivity resulting in a 1.5% increase in annual recoverable revenue. The total equipment health equation realized.